Newly manufactured by PMC, this ammunition is great for target practice and range training. It is both precision manufactured and economical serving as a great alternative to the steel cased products that are available. Each round contains a boat-tail bullet for improved long-range accuracy seated in a boxer-primed, reloadable brass casing. Good for every day shooting. I shoot from a Rem 700 and an Anderson RF85 . Both guns shoot good groups if you call 3" at 100 years. Inexpensive for daily shooting to keep the trigger finger happy. Please don't misinterpret review has nothing to do with seller luckygunner.com great service great shipping no problem there, but this ammo is some of the most inconsistent rounds I've ever shot at a hundred yards, you might get a couple to group 2 or 3in groups then everything all over the place, pretty looking ammo shoes clean statement is coming from experience shooter quality Optics and rifle,you're better off shooting match grade and I'm sure Lucky Gunner sells match Grade ammo Federal Sierra preferably good stuff. Shoots great! No FTF, FTE, FTF, super clean brass excellent service from lucky gunner!!! We shot this through a Remington 700. Rifle and shooter capable of sub 1 MOA all day any day. The best group we could get was greater than 3 moa. We never had a misfire. If you intent is to put a lot of lead in the air in the general direction of your target. It'll get the job done. But if You want to do accurate shooting it's a waste of money! Looked for a great deal on .308 ammo for my AR-10 and I must say this ammo rocked! Fired 300 rounds so far and not one FTF or FTE. Ammo was clean and didnt shoot dirty. Great accuracy out to 250 yards. Super fast delivery and packaging. I will be buying this again soon!! My Ruger SR 762 and PTR 91 SC eats this stuff up. I had problems when I first ran it through my SR 762 but after getting the first 40 rounds through it I haven't had any more problems. The only bad things is that Luckygunner can no longer ship to me because I live in an area code that bars them from shipping ammo. Other then that I still support Luckygunner and I love this ammo. I've run 300 rounds through a Ruger SR 762 with no loading or ejecting issue or FTF! On a side note....I have heard of issues with this load and prvi partisan loads in the first production run of SR's, same was true with loading issues when using Pmags in that first production run.... They have all that worked out now! I've run over a 1000rounds from match grade to generic (except steel cases) through my (non first run) SR with "0" issues and one inch groups at a 100 yards. Best Value Range Ammo. Period. Saved a dollar a round buying these. No gunk after firing. Brand new, polished casing and bullet. No failures. Grouped 1" at 50 yards with the first 3 shots I fired. No complaints. For the price, you need 500 rounds, today. I picked up 500 rounds to shoot thru my Scar 17 I shot 100 rounds thru the rifle and they ran flawlessly no complaints. 308 / 7.62x51 is not cheep and this is a pretty good deal as far as 308 goes so I will buy again. Oh and they don't attract a magnet so the indoor range has no problem letting you use them like 90% of ranges do. Lucky gunner is the best ! Still the only company I buy my ammunition from. Best value and product. I continue to buy only from Lucky Gunner. Most of the guys at Miami Pistol and Rifle Club use your company "if they don't make their own". I was impressed with this ammo. Shoots great! I am so happy with it that I am making another order! My Sig 716 loves this stuff. Accurate and reliable , stock up while you can! Great service from Lucky Gunner. Ammo was great, couldn't have been happier with the service or product. This is a good ammo for your M14 / M1A. I've had no issues with it as it shoots consistently and clean. I've gone through about 300 rds. with my M14. When cleaning after the range I only need about 3 patches to get the bore shining like a mirror. You can get cheaper brands, but my range won't allow steel. This is good ammo. great service and products. will order more. great company to do business with. This Ammo will NOT work in my Ruger 762. The rounds chamber very poorly. This is not a gripe against the ammo but a warning for that specific platform. I have fired over 500 rounds through my M1A with this ammo. Zero FTF or FTE. I love PMC and buy it for my 9mm and 45 handguns. Lucky gunner is great, fast shipping and great customer service. Before using this ammuntion, I didn't see Korea as being a large producer of anything of major quality. Boy was I wrong, and happy to be. The ammo fires beautiful, going through my ar10 without a thought of a misfire. I've fired almost 3000 rounds of this, and never had a misfire. What other ammuntion can claim that? In summary, Pmc is Hornaday quality without Hornaday price. Shot well out of my AR-10's and FAL's. Never had a misfire or failure to eject. Brass reloads well. So far so good. Have only fired a few hundred rounds through my new M1A, but have had no misfires and no fail to eject. Used this to sight my Springfield M1A Scout. 2" groups at 100m with irons. No malfunctions through 100 rounds. Not the cheapest but seems to be good quality. Just used it for the first time today to sight in my newly accuired M-14, found it to very good and will be purchasing more. I use this round primarily when shooting my 762 x51. Zero problems after 8k rounds. Initially I was unsure about this ammo from Korea, but let's face it...Korea isn't some backwater armpit. I have fired a bunch of this ammo through a pair of Armalite AR10's...16" and 20" barrels. It was every bit as good as white box Winchester NATO as far as accuracy...maybe a tiny bit better. I haven't shot any further than 200 yards. I reload also, and this appears to be very good brass. All around this is a very worthy round. I use different tipped bullets for hunting, but this is a great round for target, sighting-in, and a decent military style round for defense. Good bulk ammo, not a hi-velocity bullet but gets the job done. Burns a little dirtier than I would like but for the money, no complaints. Again this ammo is a great value for the price. Will look for this again after I use up what I have. Great service and received quickly. Had fun at range with good groups at 100yds and gun cleaned quickly.I'll be buying more. Got a personal phone call to confirm that my billing and shipping addresses were different and that everything was filled out right. They were very easy pleasant to talk to. As for PMC bronze, I phrchased 500 6 months ago at a gun show and just got another 500 from here. Haven't had an issue with my last batch and doubt I will with this batch either. Lucky Gunner had better prices than the gun show by 20$. Oh, and was at my door in 3 days. Two thumbs up. I may go days, weeks or months between orders, but each and every time I order, I'm assured I'll get what I ordered because of the inventory system, that it will come quickly, it will be packed well and it was absolutely priced right ( or I wouldnt have ordered in the first place!) Love these guys. Cheap, but not cheaply made. This is basic FMJ. 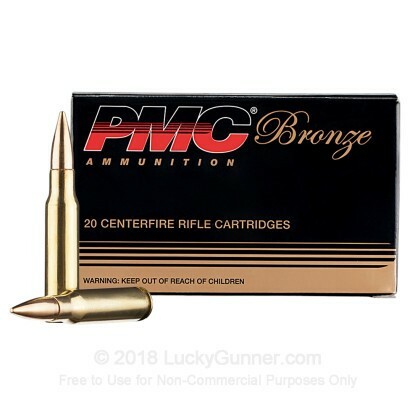 By cutting a few grains on the bullet weight, and leaving out the bullet holder inside the box, (which is basically just a waste of plastic) PMC is able to cut costs, without sacrificing value. Ashame that we have to buy a South Korean product, instead of just producing affordable ammunition Stateside, but, American's have fallen behind the powercurve for production innovation. Long story short, worth every penny. As always - great service - On the doorsteps three days after I ordered! Nice to know that it isn't back-ordered with unknown delivery date. These rounds shoot fine, and are a grate value. Shot over 100 rounds through my Ruger SR762. After a few rounds to zero in my scope, I was consistently hitting bull eyes 50 & 100 yards out. No misfires, I would definitely recommend this ammo. Great ammo and GREAT service from Lucky Gunner! Great ammo with tight groupings at 200 yards. Was very impressed at the shipped and professional service that I received from these great people! Love the email tracking! Keep up the great work! Great price and accurate, fair priced ammo..........shipped fast. Will be back like I have for quite some time! Fair price, excellent and very fast shipping! Does not get any better! as usual- great prices, great products, great service! The reason I keep coming back- great prices, great products and great service! I've put maybe 100 rounds downrange with no issues except possibly one. My SCAR 17 failed to feed, and I saw the bullet was seated improperly in the shell. Not sure if this was from the factory or if I had bent it accidentally. Great ammo at a great price (for this day and age ). Consistent shooting. I had no problems running the rounds through the PTR 91. No jams, no failure to eject. I am very happy. Great ammo at a good price. Will buy more from LG, great buying experience. Great delivery time. 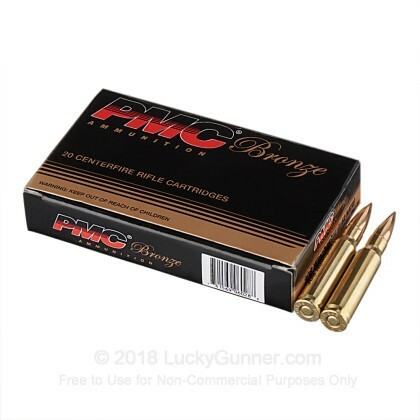 what I like about Lucky Gunner is if they advertise it they have it, and it is shipped in a hurry .PMC has always treated me right for time at the range. No problems with this ammo. Have ordered three times, fast delivery every time. Probably shoot 2,000 rounds of this a year. Ammo is accurate, feeds smoothly in my M1A and my Browning BLR. I've tried similar ammo from Bear. PMC costs a little more but keeping my rifles clean is a lot easier with PMC ammo. SCAR 17 & M1A eat like kids in a candy store. I have used PMC for years and it's clean and very accurate! The best ammo at the best price for staying sharp. I use 5.56, 7.62, 9mm, and 45 have never had a misfire or a fail to,feed. I can't say the same for Lake City ammo. I have been shooting sub MOA groups out to 450 with the 7.62 out of my FNAR Heavy for the three years I have had the gun. The shipping and price are the best from Lucky Gunner it's the only site I will buy from, have tried others and not had good experiences with any of them! Trust me you are at the right site and if they list it they have it no long wait times after you order like some other sites I could name. Trust here and buy here!!! I have had several transactions with Lucky Gunner. What a fantastic company to work with. The products are great and the service is truly second to none. I tell everybody about the products and service that I get with them. I was very pleased with the accuracy of the .308. My previous experience was with the PMC .223. I was pleasantly surprised at how well they grouped at 225 yds. Both weapons that I use my PMC ammo in .308 and .223 are bull barrel DPMS. The ammo has performed flawlessly. Big 5 star from me. Reasonably accurate and relatively clean shooting. Great ammo for the price. I love PMC ammo. Boat tail, reliable, accurate up to 500yards all day, and high quality new brass.Can't beat it as far as 147grain 308 ammo goes. Lucky Gunner has best price in stock shipped to your door fast with no hassle. 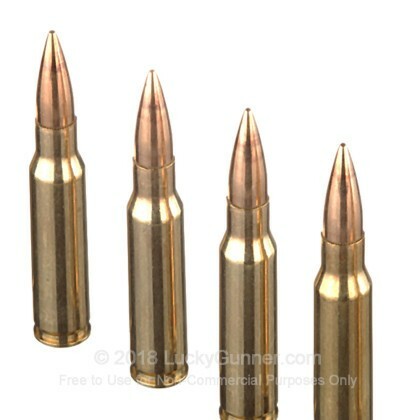 This is the second time I've ordered the 147 grain PMC FMJ-BT .308 ammo from Lucky Gunner and it's absolutely great stuff! No problems with the performance of the ammo whatsoever. I'll be buying another 500 rounds of PMC from Lucky Gunner real soon. I have purchased thousands of rounds of great PMC .223 ammo and I was not surprised when the .308 was just as good. I ran 100 of these through a new Ruger 762 last weekend. No issues with feeding or ejection. This PMC 147 gn.is great scrub ammo.I use it to get on paper when moving out on my Savage.For prcision I use only 168 gr.match Fed,Horn.Rem.! Excellent quality ammo and delivered to me lightening fast! Very good stuff, zero issues in 3 different rifles. Very clean. Accuracy was excellent out to 200 yds. Seems much better than their other 'bronze' line ammo, for accuracy. I'll be buying more. And Lucky Gunner shipped fast, and hassle free. Highly recommended. Never had a problem with PMC handgun ammo, so decided to give their rifle rounds a try. No disappointments! Yeah the 20 round boxes are cheap, but it's not worth $1+/round for ammo in nicer boxes. This was a great deal, my local gun store had the exact same case of ammo for $100 more. This ammo is quality, 0 misfires so far. I was very impressed by their shipping as well. I ordered it, and it was on my door step in Michigan in 2 days with standard shipping! Very Satisfied customer, will buy from LuckyGunner again! close ranges so beware of your targets and backstops ability to securely stop these rounds. Now tweeking my VEPR ejection port to stop my rifle from chewing up this great reloading brass. At this writing I have fired 80 rounds with decent accuracy and no misfires. Visual inspection found the ammo in excellent condition and I can use the casings for reloads. I am disappointed in the packaging of the rounds as the containers are flimsy cardboard. Also, there are no sleeves to secure the rounds inside their boxes so they are constantly falling around in their box or the surrounding area. Very good round for the price. As always, excellent fast service from Lucky Gunner. So I ordered some PMC .308 from Luckygunner for my new SCAR 17S and I couldn't be happier. The value for the performance was fantastic. will look forward to many more purchases through Luckygunner in the future. As always, Lucky Gunner has great service and prices. Bought 500rnds PMC .308 and it arrived in three days in perfect condition. Functions perfectly in my bolt action and msr. I've purchased these 3times now, and I'll be happy to say I will buy more as soon as I can. Cycled through my sig 716. The loads are consistent and makes it easier for me to find my rifles sweet spot. It's non corrosive ammo and the casings are reloadable which makes it cheaper when you either sell to a loader, or just reload your own. Hope this helped. This ammo performed as expected. I have never had a problem with PMC products and trust them to provide good quality and decent performance. The price paid was running at the market value at the time, and it was available so I jumped on the chance. Ordering from Lucky Gunner is always easy and expedient and if there is ammo at another vendor at a comparable price I will always choose Lucky Gunner due to their quality service and speed in filling and shipping the order. No misfires or misfeeds and all 1" groups at 100 yards from my new Browning BAR Hog Stalker with Burris Fullfield E1 2-7x 35mmm scope. I have alway liked PMC in handgun calibers (.38, .357, 9mm) and this .308 target ammo seems to be excellent as well. I plan to buy more soon. I have to say the ammo looks good, feeds and cycles well in my Armalite AR-10a. This is very cheap ammo and semi accurate. I was shooting at 100 yards and I got consistant groups with a few flyers.....meaning off a couple inches. Good practice or range ammo, nothing I would take to a match. I haven't had a chance to shoot this past 100 yards so I can't tell you how bad it will drop. LG is high on everything, but this is a good deal and shipping was right on time. If you want sniper accuracy or put bullets through bullet holes try something different. Great Value - ?Frustration with Accuracy? Nice shooting round. I haven't had a single misfire after 400 or so rounds, but have been frustrated with the accuracy. I'll get a couple of tight groupings then a couple that are all over the place at 100 yards (2 or 3 inches apart). I will take what feels like the perfect shot on bags and hit the bulls eye, size of a quarter at 100 yards. The next shot comes in 2 or three inches off. Could be my in experience with 308s but some how I doubt it. My roupings are a lot better with my Sako Finbear 30-06. Maybe it's the rifle? After shooting these out of my CMMG MK3 , I have been eyeing Gun Vices to see if it is the Gun, Me or the ammo. After reading other reviews I get the feeling its the ammo. Maybe I shouldn't talk until I try the gun with some match grade ammo. Not a single misfire after 100 rounds, very good price for this ammo and delivery was quick. While this ammo is cheap, it isn't all that accurate. Even at 100 yds, it was only within 2-3 MOA at best. Shooting Remington Model 700 with a bull barrel. good quality product, fast shipping. I needed some practice rounds as we are planning an Elk hunt in 2014, is just what we needed to sight guns plus get some idea of scopes we will need.since some of our firearms are new no miss fires. hit targets 300 yds every time tested with good success at 600 yards good results. A head-to-head comparison of this PMC ammo was done at 100 yds, using a Sig 716 with Geissele SSA trigger, Vortex Crossfire II 4-12 x40 AO scope. From the bench, match ammo (Federal Premium Matchking .308 Sierra BTHP 168 gr) provided sub-MOA precision. Nice weather, very little wind. I shot the PMC next and it was all over the place, maybe 4+ MOA? 20 rounds shot, seriously ~6" between some of the impacts. The price point is attractive, but I would only use this under 50 yds, perhaps for training purposes or large target shooting? Best bang for the buck out there.. Waiting for Spring to try out the ammo. Good price. Quality packing and good delivery. Rounds look to be good quality. Will review performance when I order again. I have always been pleased with Lucky Gunner. New to PMC. Typically keep std USA brands / military ammo. Heard good things from ex-mil / contractor & at shows. In this case, (Savage Mod 10F .308Win Konus Pro scope) PMC held slightly tighter groups @ 100 yds. than Federal Match. While each weapon likes various ammo, PMC performed well enough that we will likely try other PMC calibers. As a minimum, a good range round. Usually cheaper as well. Regarding Lucky Gunner, we're repeat purchasers. No problems with this company except actual count on some of the loose packaged ammo. I will always purchase my ammo and accessories from Lucky Gunner...they always can be trusted. All the ammo I have bought from Lucky Gunner has always performed as advertised or better. Your availability of ammo is spectacular as is the selection. Couple this with a fair price and well packaged,fast delivery...and it surely wins a five star revue! have used before running through a ar10 nice ammo. fast shipping, package looked great ,great price!!. Had 100 rounds before I bought this clean and accurate! !Thanks Lucky Gunner! Brass looks great for reloading also!!! I have thrown about 250 rounds down range in both a Sig Sauer 716 and an old, but very accurate, Savage, lever action single shot. I had not one hiccup with any of the rounds. No failure to fire, no failure to feed all went bang when you pulled the trigger. Groups at 200 yards were very acceptable for my ageing eyes. Using a bench rest for many of the rounds ( sand bag for the front hand guard and my shoulder for the back ), 4" groups and less were most common. I even had several that were on top of each other. Not too shabby! Lucky Gunner has always been very quick on shipping with reasonable shipping rates, excellent prices and exceptional service. I had a case of 22 ammo break open from the shipper a while back. Some of the rounds, I think there were about 20 or so, were missing. I made a quick call to LG and before I knew it, I had a new box of 50. That is service above and beyond. It can't be beat, at any price. Would I recommend Lucky Gunner, Absolutely. Besides, y'all've seen the picture of Heidi.... what more can I say! 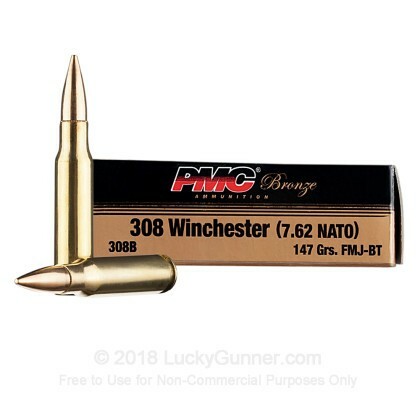 I purchased 500 rounds of PMC 308 Winchester (7.62 NATO) 147 grs FMJ-BT range ammo from the LuckyGunner. I loaded my Sig R716-16B-P-FDE mounted with an Aimpoint PRO sight. From a sitting position, I rested the rifle with bi-pod attached on a table and fired off 10 rounds at an Aimpoint zeroing target (M01590) 26 yards down range. The result: Dead center on the bull with a group within the diameter of a quarter. I fired off another hundred rounds and the rifle, the Aimpoint Pro, and the ammo performed flawlessly. The LuckyGunner provided me with excellent ammo, pricing, service, and delivery. I will definitely purchase from them again! I had used other PMC ammo in other calibers and found it to be reliable,modestly priced and fairly clean shooting.Ran a few boxes through my CETME without any issues.It is not match grade but good enough to be pretty consistent,making shooting this caliber more affordable.Order processing and delivery was quick just as it should be.LG will definitely be on the top of my go to short list. I have been using PMC for a while in other calibers. Works great. Lucky Gunner has fast and reasonable shipping compared to others. Excellent fast delivery on all purchases from them. Great job! Love doing business with you! Haven't used any yet so no comment on performance. Value is great and quality looks good. I think Luckygunner is the best site out there. Just received my 500 rounds of PMC 308 today. This is the second time I order from LuckyGunner. I requested extra box for shipping, free of charge. I love what I see when I open the box. No damages. I am so happy!! Great company. 6 Stars! This is quality ammo for the cost of reloads. This allowed me to dial in my HK91 without going broke in the process. Great value. Perfect for the range. Very pleased with the products and service I receive from Lucky Gunner. Will definitely continue to order ammo from them as well as refer to friends. Keep up the good work. I recently went out an fired the first half if this purchase back mid OCT and shot my Sig 716 only had 1 failure to extract in the first shot; after making the adjustment to my rifle as per the manual the following 259 rounds went off without a hitch. This was the first time out with this rifle and therefore the time between rounds in the beginning was longer than after about 10-15 rounds then I went through some mag dumps and cleaning, and after that the rest of the ammo was long distance practice100yrds+.. Next weekend fired the following 240 and they went great! pleasant time shooting. it was a good deal the the time and have since then found none better that I feel comfortable ordering from. I have ordered from LG many times and will continue to do so. Good product for the money.Went threw 150rds not one problem. my m1a ate it up. I guess the only complaint I have is, when I receive the package, the individual 20 round boxes were somewhat damaged, but the ammos are fine. Been using PMC 223 for awhile, decided to try PMC 308. Using it on a 308 "Hog Hunter" Savage rifle and a FAL clone, no problems at all and it's less dirty than other ammo. This is your standard target/range round. Very good price VERY good product. If you need ammo for the range this is it! I use this in my DPMS LR308 with no issues! Will order again. Lucky Gunner gets ALL of my business these days! Thanks again! Good value with quick delivery. I shot these 308's in my new Sig 716. I sighted in my red dot at 50 yards. used 10 shots. The last six were in bull and less than 1/2 inch apart. It works for me and mine. The only problem I had was the price went down $20 per 500 the day after I bought them. Very satisfied with Lucky Gunner in their quick delivery, the best of anyone I deal with. Been in outdoor range every other week and spent hundreds of these. Shoots 100 yards-bulls eye, 200 yards-ding, 300 yards-dong, 400 yards & 500 yards respectively using my ruger with nikon scope. I will keep buying PMC not only affordable, they are accurate as well. Lucky Gunner keep up your good service. great buy & shoots very well. Thanks quick shipping and quality ammo. Will order more for all my firearms. Great deal. No FTE or FTF. dirty either; I've shot a lot that was dirtier. After shooting it, I ordered another 500 rounds of PMC Bronze. dealt with haven't even started to process my order by then. Great deal on very good ammo. I've shot around 400 rounds thru my M1A and have no complaints. It's not that dirty compared to Winchester X. Great price, LuckyGunner Rocks. PMC makes a really good product. Shot in M1A and Tikka. No problems with this product. Quick ship and the insurance option is, in my opinion, really good business. I love PMC for the value. Iam also becoming a big fan of LuckyGunner. I would say that this dirtier than Federal Premium, but not by much! My HK eats this stuff easily, and it is accurate to 200yds. Good buy! Just get some! Love their 5.56 as well! My SCAR 17 loves this. Have shot 100 of the 500. No FTF or FTE, accuracy is good. Great service and a good price. Great product, at a Great price! Great product, Great price and fantastic service from the Lucky Gunner all rolled into one. Couldn't have asked for anything more and I will be back again. My DSA FAL eats PMC bronze very well. I fired 800+ rounds in a 2-day Defensive Rifle course. During which I experienced 2 "stove pipe" malfunctions. 2 out of 800 is nothing. Have fired 100 of the 500, and no problems, my SCAR 17s loves it. Haven't really used any rounds yet, but it's what I wanted (good brass at very reasonable price) Will probably by more soon. My rock river lar-8 loves this stuff . 250 rounds with no problems at all ... accurate with my weapon 3" group at 200 yrds . will continue to buy this , why look at something else when this works so well. I was very impressed with the quality of this ammo. I shot flawlessly out of my DPMS LR308. Much better than any surpluss ammo I have shot. I will be buying more and using it in my M1A. Performed flawlessly in my LRB M25. I purchased this ammo for barrel break in and I expected the accuracy to be consistent with price This ammo is not as accurate as the 168 gr. match BT at 3X the price, but this ammo is very accurate considering the price. Ammo is a great value. My MIA loves this round which I have used since the early 80's. Never a failure to feed and never a misfire. Although not match grade, I have experienced very good accuracy at reasonable combat ranges out to 300 yards. Very dependable and far superior to the Russian made round. Q: If you look at the reviews, the newer reviews talk of terrible accuracy for the most part, and the older reviews praisr the ammo for good accuracy. Has PMC had a recent QC control problem with this round, or overall ? Thanks. Looking to stock up soon, and am concerned about using other spec rounds using bimetal bullets in SS barrel. Is my concern using rounds that are bi metal causing accelerated wear in SS. M1A ? I was consifering the PMC since it uses copper jacket until I read of the dissppointing accuracy Many thanks. Your site is great ! A: Hi Jeb!. This PMC round is one of the highest quality rounds we sell, but it is a range grade ammo. I have found that it is "battle accurate" through about 500 yards, and in some rifles a bit tighter than that. If you are looking for a great quality round that is acceptable for a non-match grade rifle and gives you acceptable accuracy, then look no further. If you want to wring the most out of your rifle, we offer a lot of high accuracy match rounds that will serve you better. As to the wear on bimetallic bullets on the barrel, all of our military 7.62 ball ammo is bimetallic and is used in everything from rifles to machine guns and there is not a significant amount of wear over any other composition of bullet. The layer of steel is so soft and thin that is has no affect on the barrel. A: Hi Jim. The PMC 308 does not have crimped primers. 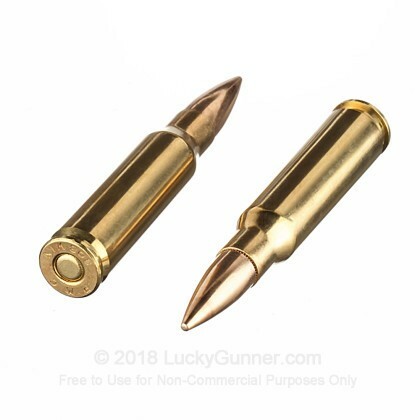 Q: Is the bullet copper jacked or bi-metal? A: Hello Tom, This PMC ammunition is loaded with a copper jacketed, lead core projectile and does not contain any steel. A: Hello Bobby, This PMC ammunition is loaded in boxer primed, brass cases that can be reloaded. Posted On: 9/3/13 By: John T.
A: These 308 Winchester rifle rounds from PMC will not stick to a magnet. Q: Is the PMC 308 ammo (147gr FMJ-BT) non-corrosive? A: PMC manufactures their ammunition with premium, non-corrosive components. We also have this 308 - 147 Grain FMJ-BT - PMC - 20 Rounds ammo in stock in a smaller quantity.